I wanted to write again about the “brothers-kryssiyans” [‘Russian rats’], but I thought – why talk about crap right before Independence Day [August 24th]? Therefore, I will write about the good. Darwin was a damn goof mistaken. Don’t believe me? Well, think about it logically. If, according to his theory, only the strongest survived, then life on Earth would have ended long ago. Some super-duper predator, way back a million years ago, would have gobbled up the last vice-super-duper predator, who, in turn, would have consumed all the others by then. Then [the super-duper predator] would have remained alone and starved to death. Well, that was a primitive preamble to my main idea. And my idea goes something like this. If only devastating and destructive forces had been winning and surviving, then life in general and civilization in particular would be long gone. Life, in itself, is a living organism the size of the universe. Now imagine that some part of the body turns on another part and completely destroys it. What will happen to the body? That’s right – it eventually dies from sepsis. I do not know the exact location of the secret fail-safe that stops unmotivated aggression and self-destruction in nature. Darwin does not mention it. But it definitely exists. And it’s not the strongest or the most predatory ones who survive, but those who help one another. Those who create beauty, not those who destroy it. And even though those are few, one righteous man is worth more than a million rapists, torturers and killers. He is the one who leads humankind, and not they. Otherwise our entire humankind would have already been raped, tortured and killed. When Armenians were fleeing the genocide, they brought with them not gold and jewels, but books that they used to teach their children. One Jeanne, the little La Pucelle [i.e. Joan of Arc], did more than all the knights of occupied France combined. One Polonaise of Oginski’s did more than all the rebellions of war-torn Poland. One Kobzar did more than all of the national liberation movements of anguished Ukraine. People are united not by a king, not by an army, but by the beauty they find in their folk culture, traditions and mentality. That tiny thing, that is dear to their heart, and rests deep in their soul. In the last moments of life, the evilest of emperors, the most terrifying of conquerors recalls not his greatest triumphs, not mountains of gold, not the worship of people – but the times when he ran to his mother so she could kiss his hurt finger better, and the times when his father tossed him up into the air, laughing the best laugh in the world. It’s no wonder that, in every era, conquerors and occupiers would, first of all, burn books and destroy artists, musicians, writers, scientists, and teachers – the Righteous Men who led the nation, ones who were stronger and more important than the army and the golden treasury of the seized country. Recently, fate took me through the town of Smile [Ukraine, pronounced Smee-leh]. I stopped to have a coffee. A young woman prepared a latté for me. Before giving me the cup, she pulled out a tiny bottle and, almost magically, drew a beautiful chocolate flower on the white foam. Then, using a toothpick, she fixed up the petals, and handed me this miracle, too beautiful to drink. 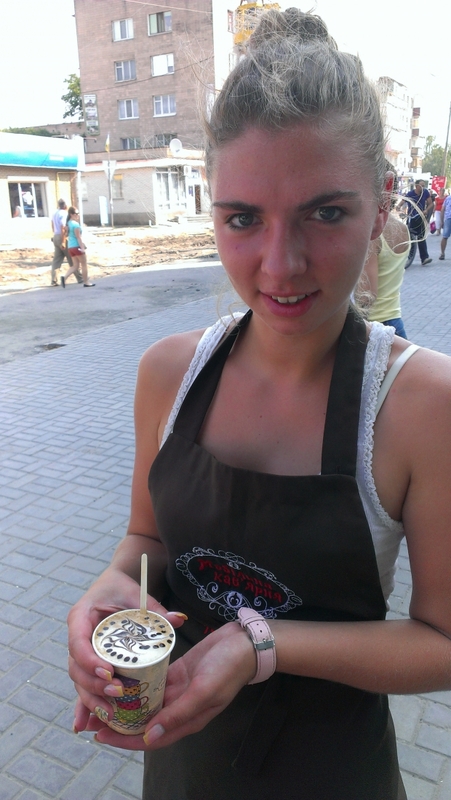 I asked her, surprised, is that something they teach coffee sellers to do, to boost demand? And she said no, she does it because she wants to. To make things more beautiful, to brighten up someone’s day. I was filled with warmth, not from the coffee, but from the touch of Greatness. To this day, I cannot get over that feeling, and keep it safe in my soul. These are the flowers that bloom in the soul of our people. In the toughest of times, during wars and famine, women had no embroidery yarn, and embroidered mens’ shirts with simple wool instead. So if you see a shirt with a flower embroidered in red wool, know that this shirt was made with the purest of love. Pure like the kiss on a child’s hurt finger. Pure like hollyhock [growing] beneath the windowsill. Everyone knows that if somewhere in the boundless territories of wild Katsapstan [Russia], you see flowers growing in someone’s yard, instead of the usual weeds, that means Ukrainians live there. In Ukraine, the villages used to have no locks. When leaving for work, people would simply prop the door up with a stick. To keep the chickens out. [Inside,] on the table, there was always milk and bread, covered with a towel. A traveler could go into any house, have some food and drink. Then thank the house, wipe his face and hands on the towel, prop the door closed with the stick again, and be on his way. Today, they just put some apples and plums – whatever has had a good yield – straight out on the street. Help yourselves, travelers! 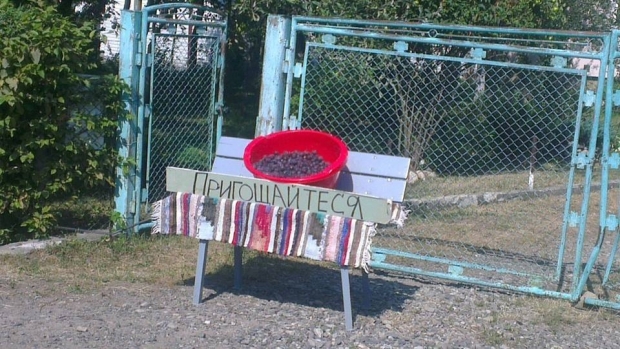 “Help yourselves!” in Kosiv, Ukraine. These are flowers of the soul, with the smell of milk, bread, and apples. I once saw a “Kobzar” [book by Ukrainian national poet/painter Taras Shevchenko] which had been buried in the ground, to hide it away from katsap [Russian] Commissars. The book was rotted from the damp, but every page, every patch that survived, had been sewn to scraps of the canvas with thread, to stop it from crumbling. There could never be a better and more beautiful embroidery in the world. Words can also be flowers. 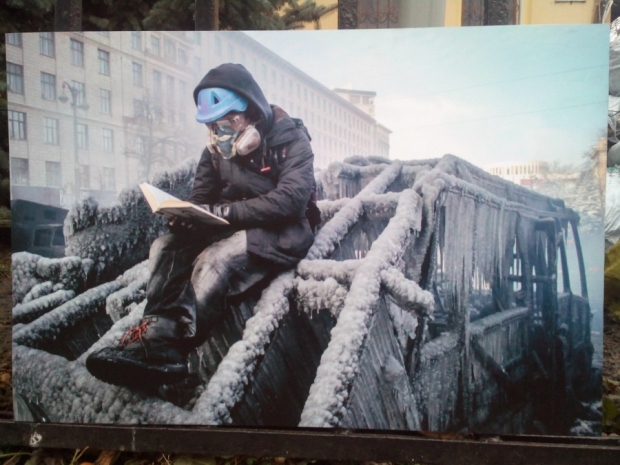 In reality, Maidan did not start when we walked out onto the main square of our country. It started that fierce winter when cars were snowed in on the roads, and people were freezing in them. And thousands of Kyivans, in their [Porsche] Cayennes and [Daewoo] Lanos’, rushed to save them, pull them out, dig them out of the snow, warm them up and feed them, never minding the danger and the cold. That winter, the flowers of the people’s soul blossomed on the snow. Invisible, but beautiful. With the smell of gasoline, sandwiches, and hot tea. The future does not belong to armies and wars, capitals and occupiers. The future belongs to the girl that draws flowers because her soul wants it. The future belongs to those gamers who left games of “Stalker” on their monitors, and rushed to defend the flaming barricades. Without breaking a single window or a single car. And who, in the intervals between battles, were reading books on philosophy and art history. The future belongs to those who have the flower of their people in their heart. Maybe you cannot see it, but it will bloom when the time is right. And Darwin – [is] a goof. P.S. I got many messages from Ukrainian biologists, explaining why Darwin was not a goof. I considered their words, and agreed with them. My statement is – Darwin is a great scientist, and a clever person. May I be forgiven. This is also a flower. A flower of intelligence, agreement, and unity. This entry was posted in "Voices" in English, Culture, English, Maidan abroad, Others, Pictures and tagged #beauty, #flowers, #FreeAfanasyev, #FreeChiygoz, #FreeDegermendzhy, #freekohver, #FreeKolchenko, #FreeKostenko, #FreeSavchenko, #freesentsov, #RussiaInvadedUkraine, #SoulFlowers, #StopRussianAggression, #UkraineUnderAttack. Bookmark the permalink. Thank you for your beautiful words, Sasha! Спасибі вам за ваші гарні слова, Саша!